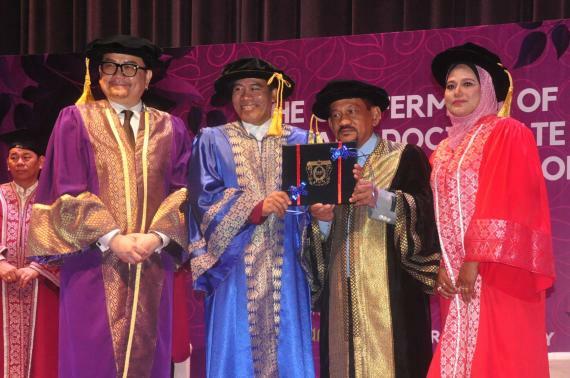 Petaling Jaya, 22 January 2019 - Dr. Helmi Harun (also a well-known artist that goes by his stage name, Helmi Gimmick) has been actively involved in the Network Marketing industry for the last 20 years. He has successfully made several products which are now popular in the market and helped more people to achieve a healthier lifestyle. His achievement and contribution to the society have earned him the Honorary Doctorate in Business Administration by SABI University. France. Annkang Wellness Sdn Bhd is a network marketing company that was founded in 2006 by Dato' Louis Chong, who is also the co-founder of Ogawa, a world-renowned brand of massage equipment. Dato' Louis Chong aims to bring Annkang's holistic wellness concept 'Detox. Regulate and Boost' through its products to benefit more people around the world. As of today. Annkang has emerged in overseas markets such as Singapore. Mauritius, Vietnam and Cambodia. Thailand and Indonesia are already in the pipeline. 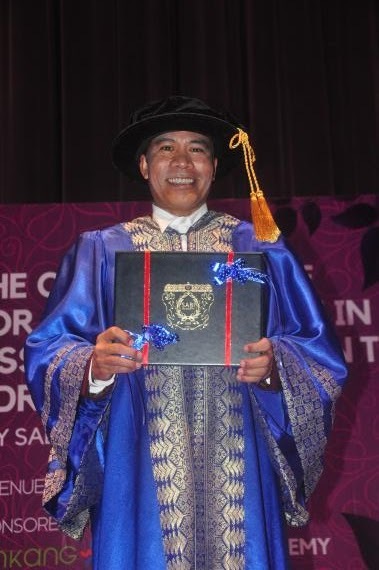 "Today marks a new beginning for Dr Helmi Harun and Annkang," said Dr Helmi after his conferment of Doctorate in Business Administration at the auditorium room of Wisma Bentley Music He continued, "I’m so pleased and honoured to receive this Doctorate title from SABI university and much gratitude to Annkang Wellness Sdn Bhd for supporting my conferment which is happening here today. I certainly will do my best to contribute back to Annkang through lectures and by training potential leaders to become future entrepreneurs for the company." According to Dato' Louis Chang, the CEO of Annkang Wellness Sdn.Bhd. the company is focused to help people in achieving a more balanced lifestyle whilst emphasizing on wellness. Additionally, Annkang also serves as an entrepreneurship platform aiming to help more people to achieve not only physical wellness but social and financial wellness as well. 'Our vision is to create a healthy, harmonious and happy life for everyone.," said Dato' Louis Chang. "We hope that more corporations will follow Annkang's vision to contribute to the entrepreneurship program enabling more people to have an opportunity to achieve their dreams in life," said Dr. Helmi Harun during the closing.